Jeff Brown's innovative and versatile drumming drives the music of some of the World's hottest artists and musicians. Recently, he has juggled national tours with Casey James, Thomas Rhett, Liana Conway, Steel Magnolia, Bucky Covington and Reeves Gabrels with studio projects for movie soundtracks, television and independent artists in Nashville and Los Angeles. Jeff's dynamic, driving style makes him a valuable voice in any ensemble; he's brought his distinctive touch to rock, jazz, punk, progressive rock and now country. The common thread is his ability to find memorable grooves that help define any song. 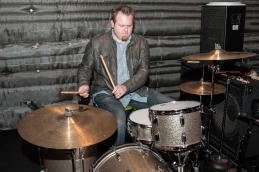 In the Fall of 2013 Jeff was called on to replace the drummer for Casey James. Fresh off the Taylor Swift Red Tour, Casey James and band enjoyed headlining theaters and clubs for the remainder of the year. For most of 2013 Jeff focused on studio work with Producer Roger Alan Nichols at his BellTone Recording Studio in Nashville. Recording mostly song demos and music cues for television. The Spring and Summer brought tour dates with Patrick Davis with a fantastic band that included Jason “Slim” Gambill (Lady Antebellum) on guitar, Annie Clements (Sugarland, Amos Lee) on bass and Les Hall (Crossfade,Trey Anastasio) on keys. 2011-2012 saw Jeff switch gears into the pop universe playing with Liana Conway. Her debut single “Beautiful Day” received airplay nationwide on Triple A radio. In the Fall of 2011 Jeff was asked to join the band for Valory Record’s newest artist Thomas Rhett. They spent November and December touring as the support act for Brantley Gilbert. 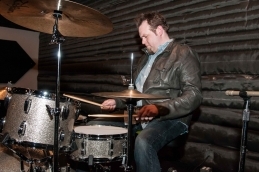 In 2010 Jeff manned the drum throne for up & coming country duo Steel Magnolia. On the strength of their debut single "Keep On Lovin' You" they headed out on their first national tour with an opening slot on Brad Paisley's H2O Summer Tour. American Idol alum Bucky Covington invited Jeff to finish out his touring schedule for 2009-2010. Which included the recording of Bucky's Live E.P. "Live From Rockingham" and the filming of his video for "Gotta Be Somebody". "His playing possesses a wonderful combination of technique, feel, heart and humor" says Gabrels, who's played with some of the world's most accomplished drummers. "Jeff Brown just happens to be my favorite." Back in Nashville, Jeff has been collaborating with producer/guitarist Roger Nichols in developing a sound and music cue library for the famed Blackbird Studios. Jeff can also be heard on recent recordings with his side project Supercharger, including guitarist Jeff Cease (Black Crowes/Eric Church) and bassist Steve Cook (Phil Vassar). Their music has been featured as the opening and closing theme songs for 'Canadian Tradition' and various PSA's and Tourism commercials in Canada. Jeff's body of work has ranged from touring and recording with 'American Idol' alums Bucky Covington and Casey James, performing with Guitar hero Reeves Gabrels, touring with Thomas Rhett and Steel Magnolia to appearing on the movie soundtracks for Fantastic4 and Elektra with Wind-Up recording artist Megan McCauley. Tracked a song for the band Paramore along with sessions and tours with Jen Foster on American Garage Records, singer/songwriter Patrick Davis, Los Angeles indie rock band Kill Devil Hill, and pianist Sali Hagan. Jeff has also played live with the legendary Steve Cropper and the great Peter Wolf. Jeff got his start in Orange County, CA, where he played with a variety of successful club bands before moving southeast and joining Dreaming In English, a hugely popular regional band that toured extensively through the mid-90s to 2001. They released a well-received disc, 'Stuff' in 1998.